This morning I had the pleasure of writing a new old friend. Let me explain. My letter will be going off to Barbara in Rhode Island. I was quite excited to be writing her because Barbara and I had lost touch for many years and only recently did we reconnect. If you’re like me you love making new friends, but your old friends are very precious. Only with old friends do our old memories come back to life and sharing old memories, sharing anything, doubles the joy. I first met Barbara years ago in Boston where we both were teachers and newlyweds. That was an exciting time for both of us so it will be fun to not only catch up on our current lives, but also to revisit those great old times we shared together. 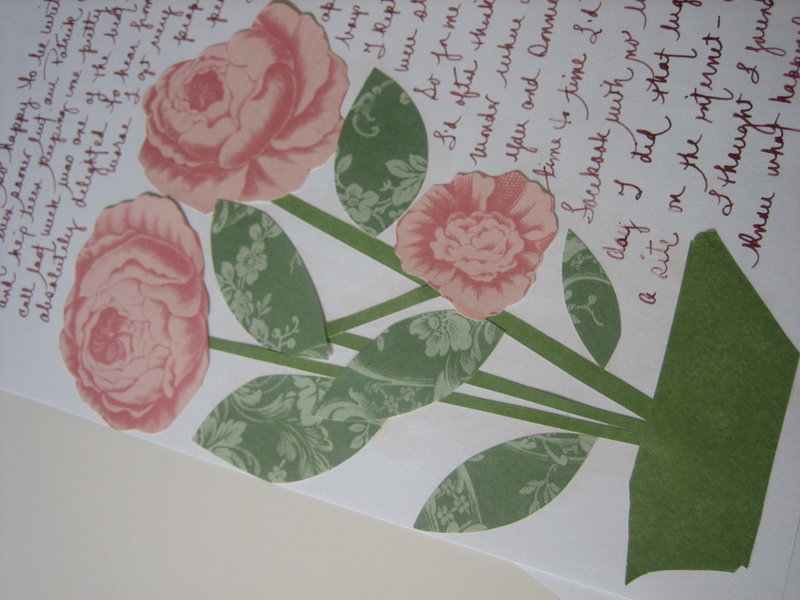 My first letter to friends is always written on stationery I create by assembling decorative papers in the form of floral bouquets. Do you have a ritual for choosing your letter papers? There are so many possibilities: store-bought papers, greeting cards made into letter books, photo note cards, watercolor drawings … the choices are endless. So that I don’t get waylaid by the decision-making process of what stationery to use I’ve created a list of my options. Now, at letter writing time, that list helps me decide who gets what papers. Creating rituals – who to write, when, where, how, and with what, helps make letter writing almost automatic and definitely more fun! 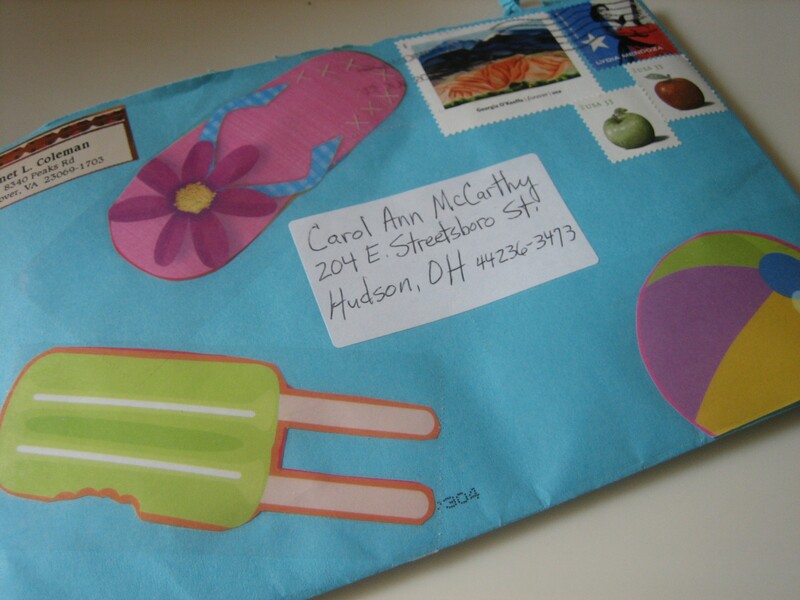 And it’s not only the letter paper, but also the envelope that can be decorated many different ways. 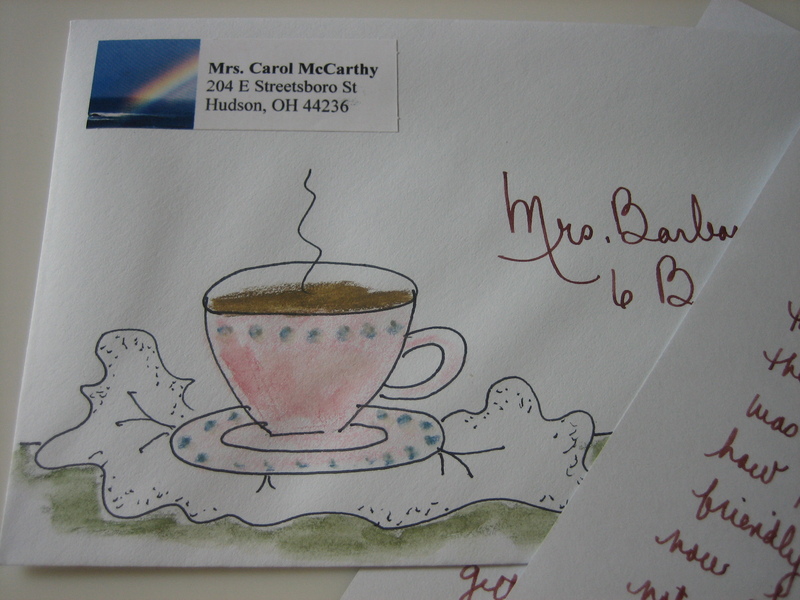 This week my letter friends are getting a cup of coffee or tea, whatever they prefer. Most of my pen friends have great fun designing their letter envelopes. and here’s another of Janet’s envelopes where she’s in the mood for some Summer fun. Janet loves to take pictures. Do you? She shares these pictures in her letters. You know what they say – one picture is worth a thousand words. Pictures really make letters come to life. 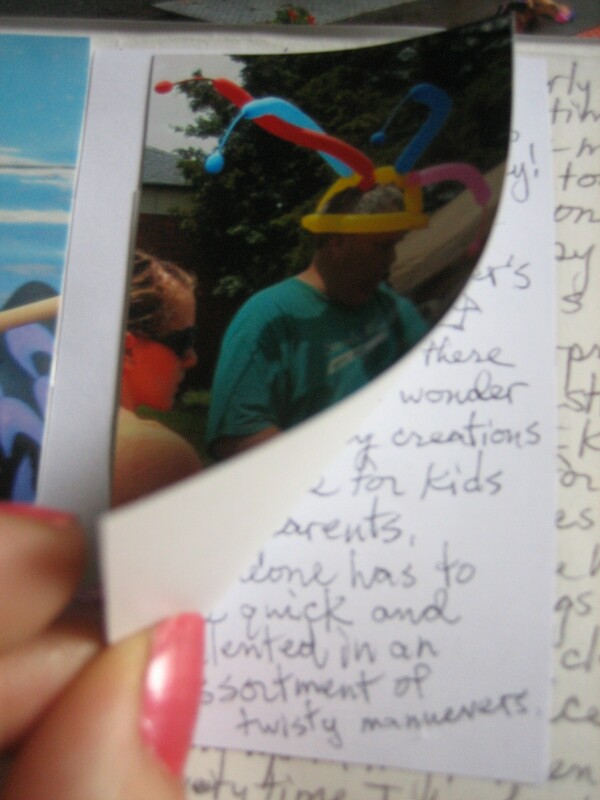 In this summery letter Janet created a collage of many of the images she saw and photographed in recent days. She put the images together, even drawing a “Happy Summer” sign for the airplane to pull through the sky. You may also notice she was writing on stationery that looked like a real sky, a nice touch for her airplane. 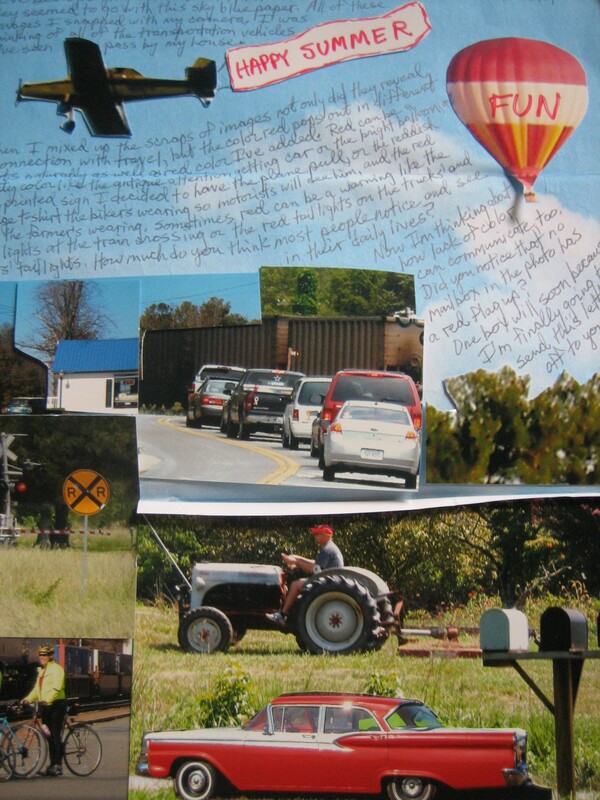 The hot air balloon says “FUN” and that’s what Janet’s letters are – real fun to see! 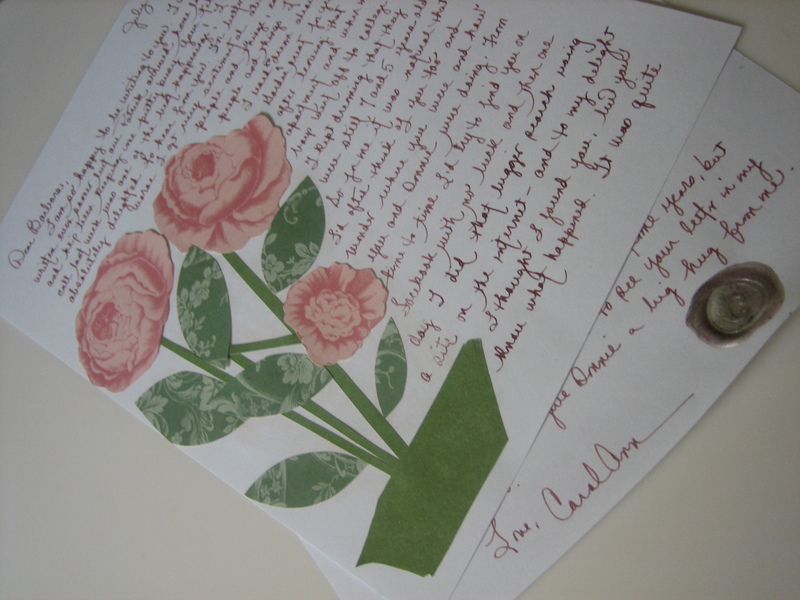 In many of Janet’s letters there are little fold-out pages (little booklets) attached to the letter’s page. These fold-outs contain even more pictures. When I get a letter from Janet I feel like I’m carried away to wherever she wants to take me. Good letters will do that you know. In her most recent letter she shared a series of performances she attended relating to the American Revolution. 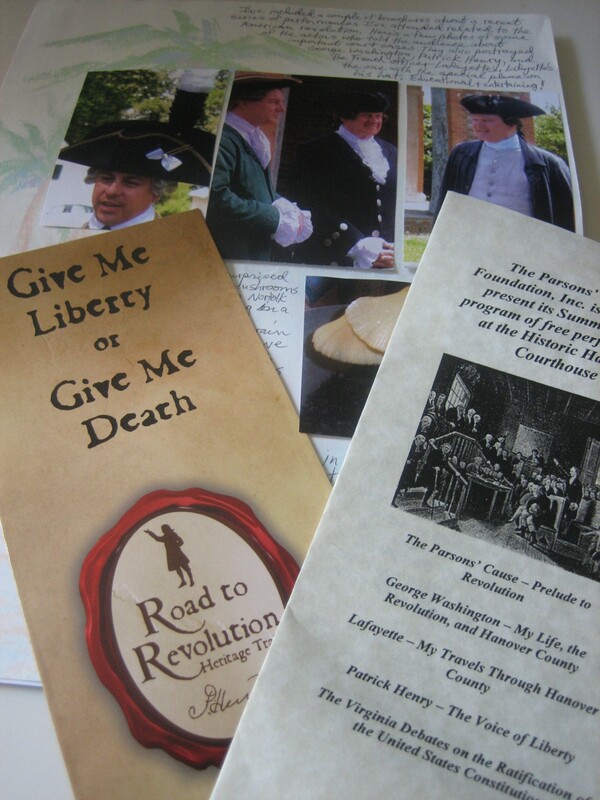 Janet lives in Virginia and this program entitled “The Road to Revolution Heritage Trail” linked historic sites and institutions in Virginia interpreting the life of Patrick Henry, orator of the Revolution and Virginia’s first governor. 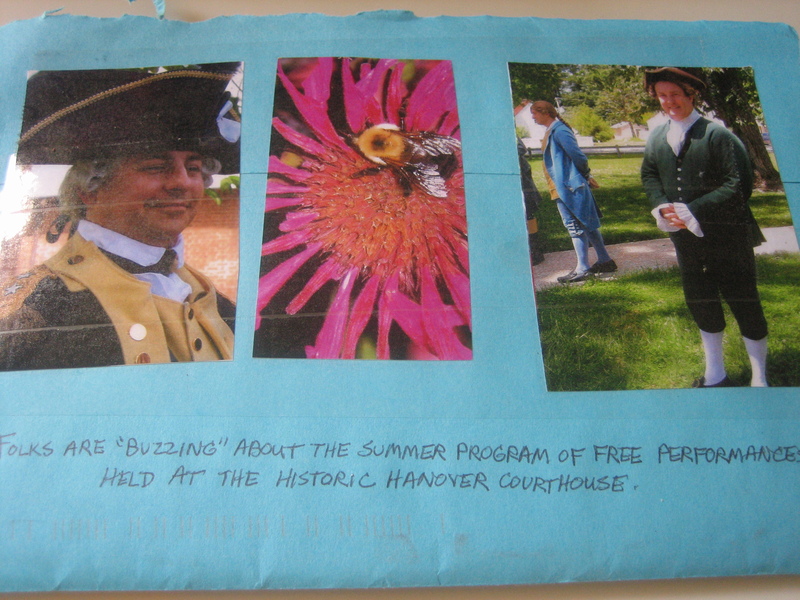 Reading about this program was good, but seeing her photographs of the men playing the parts of George Washington, Patrick Henry and the French marquis, Lafayette was even better. Janet has so many pictures to share in her letters. They’re everywhere – in the letter, on the front of the envelope and even on the envelope’s back. 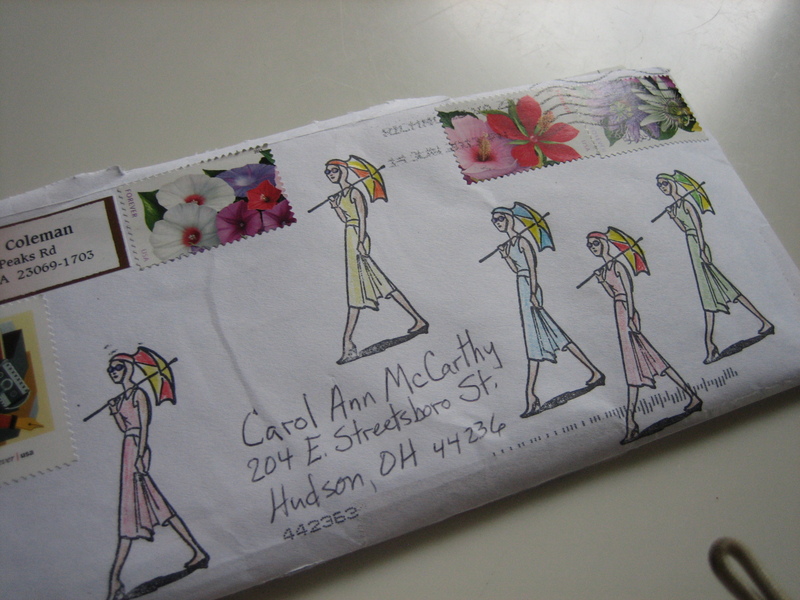 Her letters are a visual treat besides being full of interesting commentary and thanks to her interesting envelopes the postal workers who handle her letters get a little treat too. I bet you wish Janet was one of your letter friends. Well, I love to include photographs in my letters just as Janet does. 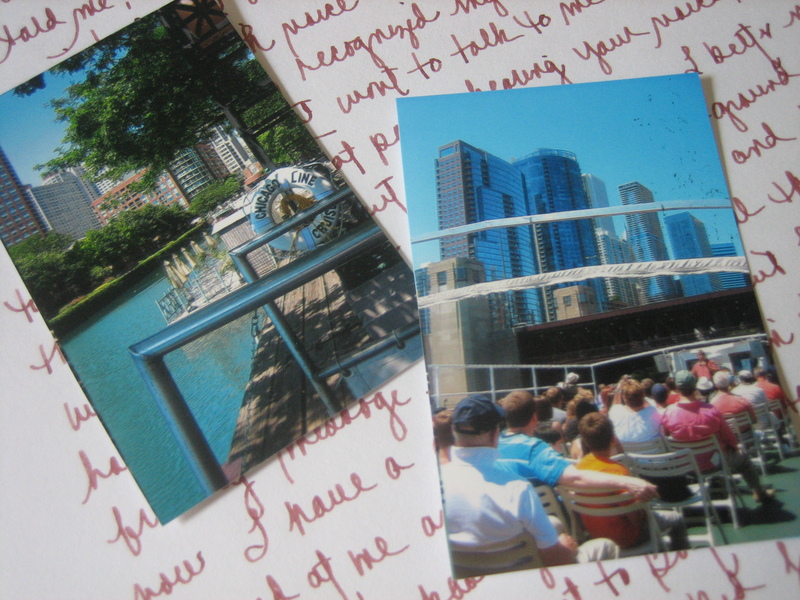 Last week I was in Chicago enjoying an architecture river cruise through the city and you know how I feel about sharing my joy – so I took a million pictures all along the ride in order to have the fun of sharing that experience via pictures with my pen friends in future letters. 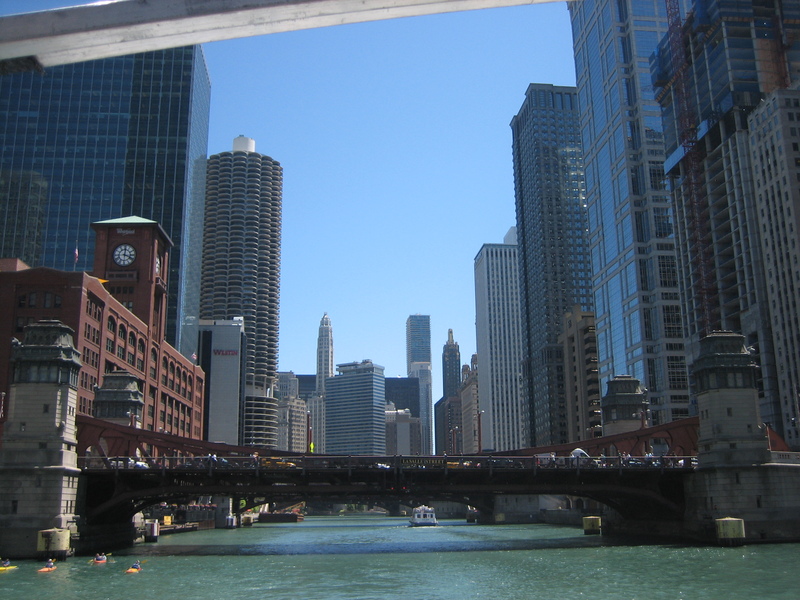 Two of my many photographs of the Chicago river cruise. If you have a camera I hope you’re using it not only to capture images for your own pleasure, but also for the pleasure of your letter friends. But of course the best things about letters are all the thoughtful ideas they convey. More than in-person conversations letters seem to draw ideas out of us and they are a marvelous vehicle for sharing, sharing our own ideas and sharing the ideas we come upon while reading. When writing a letter we have time to find that book we’re enjoying and copy the lines we love. Yes, it’s slow-going, but this helps us not only focus on those ideas but also remember them. What beauty and creativity have you shared with someone today? It’s not too late. You can write a letter any hour of the day or night. Go ahead. Make someone’s day! Have I told you how much I love your blog?!?!? I know I have many times!! I sure hope I get one of those tea/coffee cups!! You are such a sweetie. Did you ever hear from Evelyna? Yes, I did and I was so thrilled!! She apologized for not having the time to do an “artsy” letter but I was just glad to hear from her.